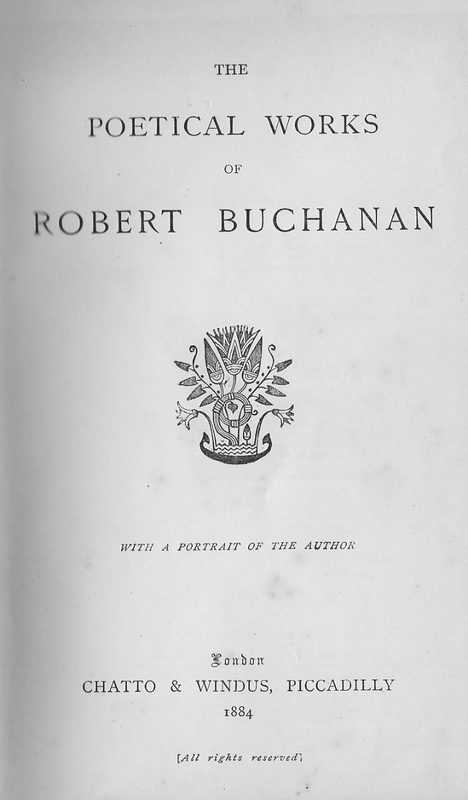 The Poetical Works of Robert Buchanan. The second edition of Idyls and Legends of Inverburn, published in 1866, contained a similar sequence under the same title, with the following poems: ‘The River’, ‘In The Mountains’ and ‘Snow’. This is the revised sequence from the 1874 Poetical Works and is available in the Idyls and Legends of Inverburn section. ‘I. Down The River’ - originally published in All The Year Round (15 September, 1860), included in the second edition of Idyls and Legends of Inverburn (1866) in the Juvenilia section as the first poem, ‘The River’, in the ‘Pastoral Pictures’ sequence. ‘II. The Summer Pool’ - originally published in All The Year Round (28 August, 1869). ‘III. Up The River’ - originally published in The St. James’s Magazine (October, 1862). Revised and retitled, this was included in the second edition of Idyls and Legends of Inverburn (1866) in the Juvenilia section as the second poem, ‘In The Mountains’, in the ‘Pastoral Pictures’ sequence. ‘IV. Snow’ - originally published in All The Year Round (29 December, 1860), included in the second edition of Idyls and Legends of Inverburn (1866) in the Juvenilia section as the third poem in the ‘Pastoral Pictures’ sequence. ‘To The Luggie’ - from North Coast and Other Poems, 1867, where it was entitled ‘The Brook’. It appeared under this title in the 1874 Poetical Works. ‘Fra Giacomo’ - originally published in Temple Bar (February, 1866) and included in Ballads of Life, Love and Humour (1882). ‘Cloudland’ - originally published in The St. James’s Magazine (July, 1863) under the title, ‘John Keats in Cloudland’and included in Idyls and Legends of Inverburn, (2nd. edition, 1866). ‘Cuckoo Song’ - originally published in The Argosy (July, 1866) and included in Ballads of Life, Love and Humour (1882). ‘The White Deer’- originally published in Cassell’s Magazine (July, 1874) and included in Ballads of Life, Love and Humour (1882). ‘Convent-Robbing’ - originally published in The Argosy (November, 1866) under the pseudonym, ‘Walter Hutcheson’ and included in Ballads of Life, Love and Humour (1882). ‘Convent-Robbing’ is a complete reworking of the story of ‘Cloister Robbing’ which appeared in Ballad Stories of the Affections: From the Scandinavian (1866). ‘The Ballad of the Wayfarer’ - originally published in The Saint Pauls Magazine (September, 1872) under the pseudonym, ‘T. M.’ and included in Ballads of Life, Love and Humour (1882). ‘In Spring-Time’ - from Ballads of Life, Love and Humour (1882). ‘The Fisherman’ - from Ballads of Life, Love and Humour (1882). ‘The Churchyard’ - from Ballads of Life, Love and Humour (1882). ‘Sea-Wash’ - originally published in Wayside Posies, a collection of anonymous poems, edited by Robert Buchanan, engraved by the Brothers Dalziel and published by G. Routledge in 1866, under the title, ‘On The Shore’. It was included in the 1874 Poetical Works and Ballads of Life, Love and Humour (1882). ‘Earth And The Soul’ - originally published in Cassell’s Magazine (August, 1874) and included in Ballads of Life, Love and Humour (1882). ‘A Curl’ - originally published in Temple Bar (March, 1862) and included in Ballads of Life, Love and Humour (1882). ‘Love And Time’ - from Ballads of Life, Love and Humour (1882). This is essentially the Second Edition of Undertones, published by Alexander Strahan in 1865, rather than the earlier Moxon edition of 1863. IDYLS AND LEGENDS OF INVERBURN. And mingling with the regions of the rain! ‘The Lowland Village’ - The introductory ‘Preamble’ of the original version of Idyls and Legends of Inverburn (1865) was omitted from the Second Edition (1866) and replaced by the above verse. ‘The Lowland Village’ appeared in the Selected Poems (1882) and is a reworking of two verses of the original ‘Preamble’. ‘The Dead Mother’ - originally published in Idyls and Legends of Inverburn as ‘The Legend of the Stepmother’. This title was changed to ‘The Dead Mother’ in all subsequent publications of the poem. This version of Idyls and Legends of Inverburn omits two poems from the original edition, ‘The Two Babes’ and ‘The Legend of the Little Fay’, which were also omitted from the Second Edition. 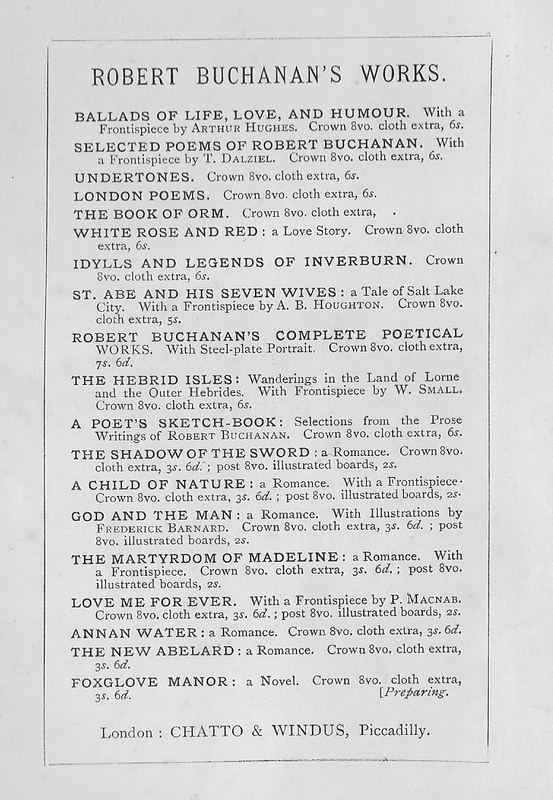 These poems do not appear elsewhere in the 1884 Poetical Works, unlike the additional poems in that Second Edition, ‘Cloudland’ and ‘Pastoral Pictures’, which are included in the ‘Early Poems’ section. ‘The Blind Linnet’ - original title, ‘The Linnet’. ‘3. Intercession’ - originally published in Good Words (July, 1871), reprinted in the 1874 Poetical Works. ‘The City Asleep’ - originally published in London Society (March, 1869), reprinted in the 1874 Poetical Works. ‘Up In An Attic’ - originally published in The Argosy (October, 1866), reprinted in the 1874 Poetical Works. ‘To The Moon’ - originally published in London Society (February, 1868), reprinted in the 1874 Poetical Works. ‘Spring Song In The City’ - originally published in London Society (May, 1868), reprinted in the 1874 Poetical Works. ‘In London, March 1866’ - originally published in The Argosy (April, 1866), reprinted in the 1874 Poetical Works. ‘A Lark’s Flight’ - originally published in The Spectator (August, 1868), reprinted in the 1874 Poetical Works. ‘De Berny’ - from the 1874 Poetical Works. ‘The Wake Of Tim O’Hara’ - originally published in All The Year Round (July, 1869), reprinted in the 1874 Poetical Works. ‘Kitty Kemble’ - there is a letter from Buchanan to Alexander Strahan of 1st February, 1873, enclosing a copy of ‘Kitty Kemble’ for publication in The Saint Paul’s Magazine. For some reason it did not appear in the magazine and its first publication seems to be in the 1874 Poetical Works. ‘The Swallows’ - originally appeared in Wayside Posies, a collection of anonymous poems, edited by Robert Buchanan, engraved by the Brothers Dalziel and published by G. Routledge in 1866. 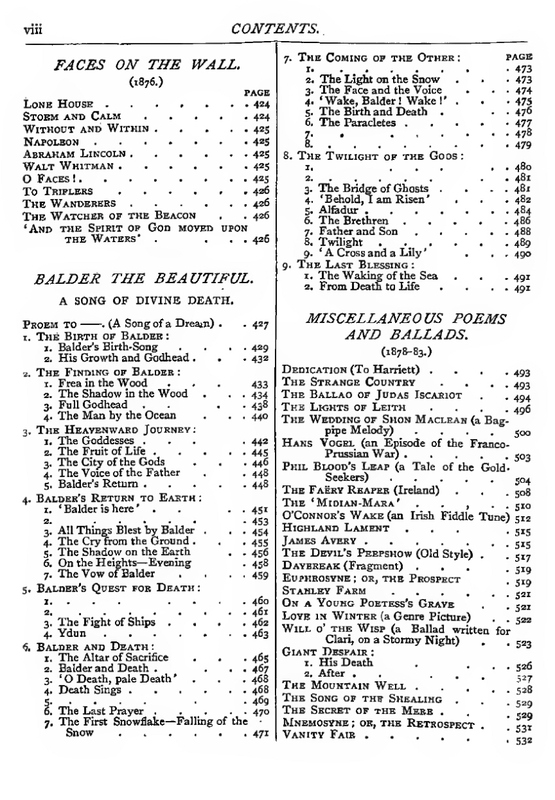 ’The Swallows’ was reprinted in the 1874 Poetical Works and Ballads of Life, Love, and Humour (1882). ‘Tom Dunstan, Or, The Politician’ - from the 1874 Poetical Works. ‘O’Murtogh’ - from the 1874 Poetical Works. ‘The Bookworm’ - originally published in All The Year Round (October, 1871), reprinted in the 1874 Poetical Works. ‘The Last Of The Hangmen’ - originally published in The Saint Pauls Magazine (January, 1872), reprinted in the 1874 Poetical Works. ‘London, 1864’ - from London Poems, 1866. The poem was revised for the 1874 Poetical Works, and this version of ‘London, 1864’ was then included 1884 edition of the Poetical Works. ‘The Modern Warrior’ - from the 1874 Poetical Works. ‘Pan: Epilogue’ - originally published, as ‘Pan’, in The Saint Pauls Magazine (June, 1872). ‘Pan: Epilogue’ was reprinted in the 1874 Poetical Works. ‘L’Envoi To London Poems’- This appeared in the 1874 Poetical Works as ‘L’Envoi To Vol. I’. 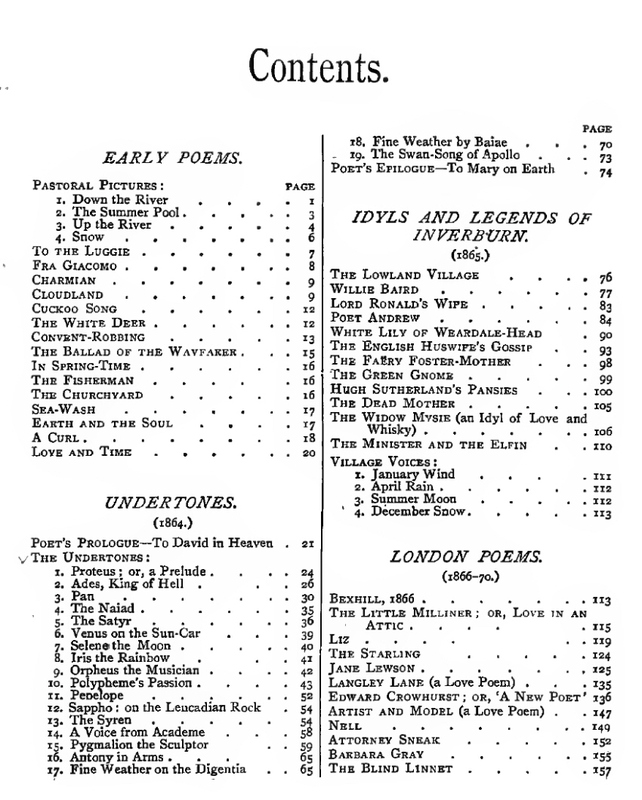 This version of London Poems includes the original 13 poems, plus 18 others with London ‘connections’, most of which had been published in magazines and then reprinted in the 1874 Poetical Works. The original London Poems also included a Miscellaneous section with four other poems. In the 1884 Poetical Works two of these appear in the next section, the other two in the ‘North Coast’ section. ‘The Gift Of Eos’ - from London Poems, 1866. ‘Clari In The Well’ - originally published in Good Words (August, 1871), reprinted in the 1874 Poetical Works. ‘Serenades’ - from Ballads of Life, Love, and Humour, 1882. ‘In The Garden’ - from Ballads of Life, Love, and Humour, 1882. ‘In The Garden’ is a revised version of ‘Erôs Athanatos’ which was originally published in The Gentleman’s Magazine (May, 1874). The original version is available here. ‘The Asrai (Prologue to the Changeling)’ - originally published in The Saint Pauls Magazine (April, 1872), reprinted in Ballads of Life, Love, and Humour, 1882. 6. The Abbot Paul’ - originally published in the extra Christmas number of The Gentleman’s Magazine (December, 1875), reprinted in Ballads of Life, Love, and Humour, 1882. ‘To Clari (with the Preceding Poem)’ - from Ballads of Life, Love, and Humour, 1882. 4. ‘And the Spirit of God moved upon the Waters’’ - from North Coast and Other Poems, 1867. 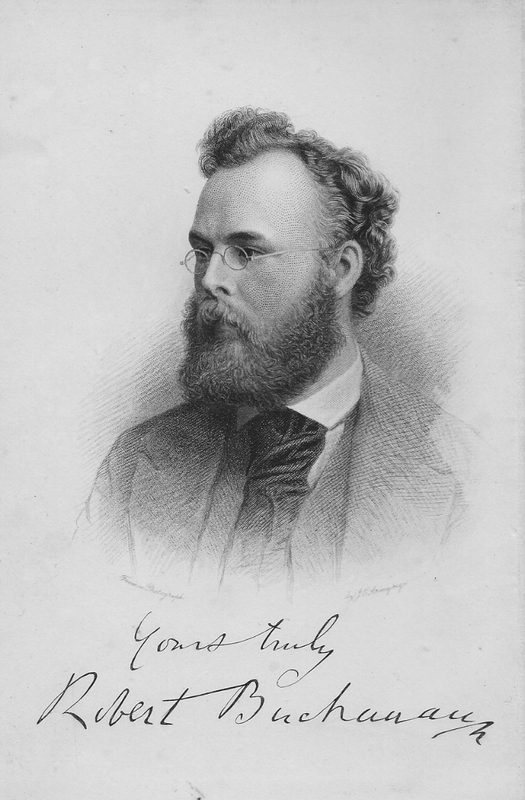 A revised version (which added the titles of the four parts) was published in the 1874 Poetical Works, and this version was then reprinted in the 1884 Poetical Works. ‘The Battle Of Drumliemoor (Covenant Period)’ - from North Coast and Other Poems, 1867, revised for the 1874 Poetical Works. ‘The Northern Wooing’ - from North Coast and Other Poems, 1867, revised for the 1874 Poetical Works. ‘An English Eclogue’ - from North Coast and Other Poems, 1867, revised for the 1874 Poetical Works. ‘A Scottish Eclogue’ - from North Coast and Other Poems, 1867, revised for the 1874 Poetical Works. ‘The Scaith O’ Bartle’ - from London Poems, 1866, revised for the 1874 Poetical Works. ‘The Glamour’ - from London Poems, 1866. ‘Sigurd Of Saxony (Mediæval)’ - from North Coast and Other Poems, 1867. ‘A Poem To David’ - from North Coast and Other Poems, 1867. Several poems from the original North Coast and Other Poems are omitted in this version: ‘The Exiles of Oona’, ‘The Saint’s Story’, ‘The Northern Muse’, ‘The Ballad-Maker’ and ‘The Ballad of the Stork’. ‘A Prelude’ and ‘Celtic Mystics’ were subsequently reworked for inclusion in The Book of Orm. And ‘The Brook’ appears as ‘To the Luggie’ in the Early Poems section. ‘Coruisken Sonnets - from The Book of Orm, 1870, reprinted in the 1874 Poetical Works. 1. Lord, Is It Thou? 7. Lord, art Thou here? 14. Could God be judged? The ‘Coruisken Sonnets’ originally appeared as Section VII of The Book of Orm (1870). 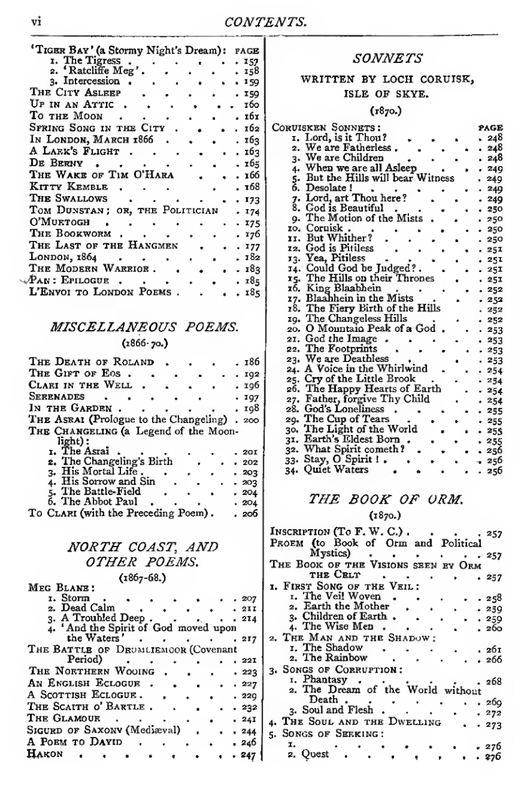 In the 1874 Poetical Works, they were separated from a revised version of The Book of Orm, and this arrangement was then replicated in the 1884 Poetical Works. night may arise in our minds towards DIVINE MYSTERIES.’—STUDENT’S PRAYER, BACON. ‘To vindicate the ways of God to man.’—MILTON. shall vindicate Evil, proving God’s mercy to His creatures, great and small.’—A RUNE FOUND IN THE STARLIGHT. That prayers can gain of God, I send to thee! Hath conjured out of Night since Time began. And whither each departs to find repose. 7. The Devil’s Prayer - the original title is ‘Prayer from the Deeps’. 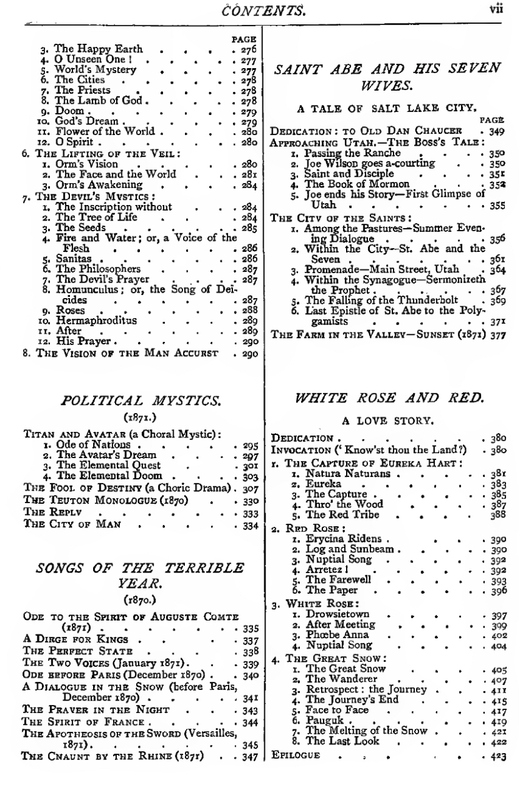 The 1874 reworking of The Book of Orm is succeeded by versions of Napoleon Fallen and The Drama of Kings (both 1871) which also appeared in the 1874 Poetical Works, although their positions here are reversed, ‘Political Mystics’ had appeared in Volume 3, and ‘Songs of the Terrible Year’ in Volume 2. The variations from the original versions are detailed in the section concerning the 1874 Poetical Works (‘Songs of the Terrible Year’, ‘Political Mystics’) as well as in the transcriptions of Napoleon Fallen and The Drama of Kings. 1. Ode Of Nations - Chorus (The Drama Of Kings, pp. 47-54). 2. The Avatar’s Dream - Buonaparte’s soliloquy (The Drama Of Kings, pp.110-128). 3. The Elemental Quest - Chorus (The Drama Of Kings, pp. 128-136). 4. The Elemental Doom’ - Choric Interlude: The Titan (The Drama Of Kings, pp. 137-156). ‘The Fool Of Destiny’ - Napoleon Fallen, 1871. Revision in The Drama of Kings, ‘Napoleon Fallen’ (The Drama Of Kings, pp. 157 - 260). ‘The Teuton Monologue (1870)’ - a combination of the two speeches by The Royal Chancellor (The Drama Of Kings, pp. 301-306, 308-315). ‘The Reply’ - Chorus (The Drama Of Kings, pp. 315-321). ‘The City of Man’ - originally appeared as ‘The Final Chorus, or Epode’ of Napoleon Fallen. In The Drama of Kings it was revised and moved to the end of the poem where it appeared as the ‘Epode’ (The Drama Of Kings, pp. 443-437). SONGS OF THE TERRIBLE YEAR. *** These ‘Songs,’ inasmuch as they formed a portion of the ‘Drama of Kings,’ preceded by a long period the publication of Victor Hugo’s series under the same admirable title. The ‘Drama of Kings’ was written under a false conception, which no one discarded sooner than the author; but portions of it are preserved in the present collection, because, although written during the same feverish and evanescent excitement, they are the distinct lyrical products of the author’s mind, and perfectly complete in themselves. ‘Ode To The Spirit Of Auguste Comte (1871)’ - Dedication (The Drama Of Kings, pp. vii-xiii). ‘A Dirge For Kings’ - In the version of Napoleon Fallen in The Drama of Kings, Buchanan replaced the opening scene with the German Citizens with this Chorus. In the subsequent version, ‘The Fool of Destiny’, the first scene was reinstated and this chorus was omitted. ‘The Perfect State’ - Choric Epode (The Drama Of Kings, pp. 271-276). ‘The Two Voices (January 1871)’ - from Choric Interlude: The Two Voices (The Drama Of Kings, pp. 265-269). ‘Ode Before Paris (December 1870)’ - Chorus (The Drama Of Kings, pp. 281-284). ‘A Dialogue In The Snow (before Paris, December 1870)’ - from the dialogue between Chorus and A Deserter (The Drama Of Kings, pp. 321-332). ‘The Prayer In The Night’ - Chorus (The Drama Of Kings, pp. 333-338). ‘The Apotheosis Of The Sword (Versailles, 1871)’ - from the Scene inside the Hall of Mirrors (The Drama Of Kings, pp. 394-403). ‘The Chaunt By The Rhine (1871)’ - from the same Scene, the dialogue between the Chorus and The Chiefs (The Drama Of Kings, pp. 407-417).